11, 17, 24, 34, 41, 42 & 48. Bonus 21. Winning Hand: 6-S, 4-C, Q-D, 7-C, 9-S.
5, 19, 20, 27, 34 & 36 Bonus 21. 26, 33, 36, 39, 43, 45, 48, 51, 55, 62. 35, 36, 42, 50, 52, 53, 62, 64, 65, 68. 2, 10, 13, 16, 31 & 43. Bonus 8. 11, 26, 32, 34, 40 & 43. Bonus 15. Winning Hand: 7-H, 7-S, 8-D, K-S, 7-C.
2, 9, 13, 27, 28 & 31 Bonus 11. 39, 41, 44, 47, 53, 59, 60, 63, 64, 70. 32, 37, 38, 44, 53, 55, 56, 62, 68, 70. The Mega Millions jackpot was finally won on Tuesday night, and a single lucky ticket holder in South Carolina can claim a tremendous lottery jackpot – $1.537 billion ($878 million cash). The winning numbers for October 23 are the white balls the white balls 5, 28, 62, 65 and 70, plus the gold Mega Ball 5. The history-making Mega Millions jackpot smashed the former Mega Millions record of $656 million set in March 2012, and is just shy of the $1.586 billion Powerball prize in January 2016 which was shared by three winning tickets. The jackpot had been rolling since July 24, when a California office pool of 11 co-workers shared a $543 million prize. Three other jackpots have been won this year – $451 million on January 5 (Florida), $533 million on March 30 (New Jersey), and $142 million on May 4 (Ohio). In addition to the jackpot winner, the sales frenzy produced a whopping 36 second prize tickets – each matching the five white balls drawn Tuesday night. Eight were in California, four each in Florida and New York, two each in Massachusetts, Michigan, North Carolina, New Jersey and Virginia, and one each in Arizona, the District of Columbia, Iowa, Kentucky, Missouri, New Mexico, Ohio, Pennsylvania, Texas and Wisconsin. The Texas winner and one of the Florida Match 5 winners included the optional Megaplier, so those two tickets are worth $3 million each. For matching four white balls plus the Mega Ball, 419 tickets won the game’s $10,000 third prize Tuesday night. Fifty-one of those are actually worth $30,000 each because they included the optional Megaplier. In total, there were 15,750,013 winning tickets Tuesday night in addition to the jackpot winner. 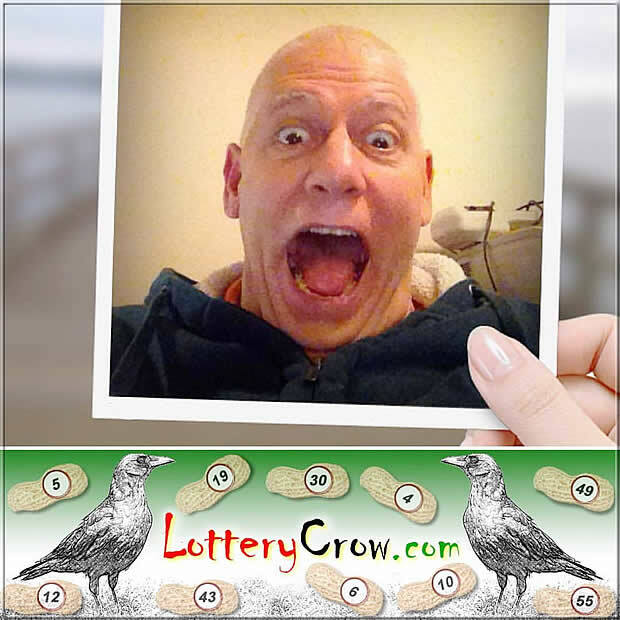 In this 26-draw jackpot run, beginning with the July 27 drawing there were more than 50.2 million winning tickets at all prize levels, including 85 worth $1 million or more and the jackpot winner. For the next drawing on Friday, October 26, the jackpot resets to its starting value of $40 million ($22.8 million cash). 10, 15, 16, 17, 19, 27 & 38. Bonus 9. Winning Hand: 8-S, 7-C, J-H, 4-S, 9-D.
6, 7, 22, 25, 31 & 36 Bonus 1. 44, 49, 50, 54, 57, 60, 62, 65, 66, 67. 39, 42, 43, 51, 52, 56, 58, 64, 66, 69. 8, 9, 12, 20, 22, 27 & 30. Bonus 28. Winning Hand: 2-C, A-S, 5-D, 7-D, K-C.
12, 19, 28, 29, 33 & 37 Bonus 27. 27, 38, 41, 42, 43, 44, 48, 56, 67, 68. 44, 51, 53, 54, 56, 57, 58, 60, 61, 65. 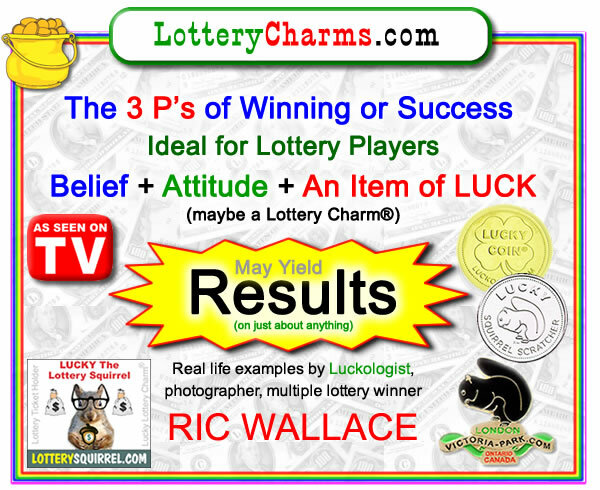 Belief + Attitude + An Item of LUCK (maybe a Lottery Charm®) May Yield Results on just about anything. To win on the lottery – just add a ticket or ballot. Picture what you want, need or desire. The dream home we won, we took several high res mental pictures, not just one. A cheap camera – low megapixels – will take a fuzzy picture and give fuzzy results. When I take a mental picture, I use a 1000+ mega pixel image – lots of detail. I was able on paper to draw a complete layout of the house I was going to win (not just wishing) from the mental images stored in my head. I had my wife do the same thing – making a game we were playing to win. If you feel you do not have the abilities to take a mental picture like I can, get photos of what you want by cutting pictures out of magazines or catalogs, or searching on the internet and print them out in COLOR. Look at them, then close your eyes and try to picture what you see as if it is yours. Consider a cork or bulletin board and pin the photos to it and place it somewhere you spend lots of time – like beside a computer. You can use regular push pins or consider a lucky SQUIRREL PIN like I did. 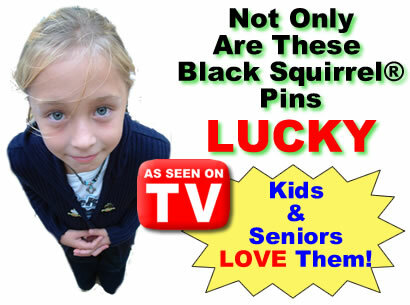 If someone asks why you have all these pictures attached with squirrel pins, simply reply that you plan on SQUIRRELING AWAY all the stuff like a squirrel. It paints a picture. Some people attach photos of what they want to bathroom mirrors and even use a MAGNET to attach to a fridge or the back of the door to their home so they see it every time they leave. To process a picture you need a camera with either film or a memory card. After you take the picture, the film has to be developed or digital image transferred to a computer, so you can see it or print out on photographic paper. You can adjust things such as cropping, color, size, etc. To win the lottery you need a ticket, ballot, etc. combining it with the mental picture you create in your mind. 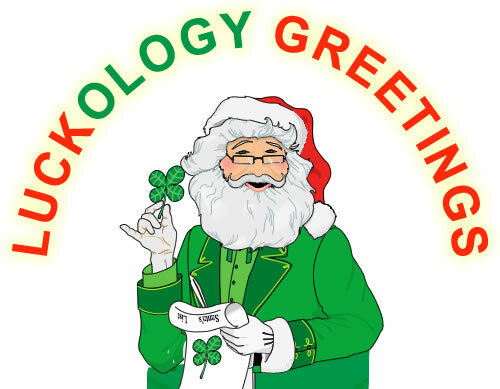 Adding an item of luck is a tangible item you can use to connect the two. Then process the dream into a memory (an affirmation). A memory is a past tense of something that already happened. 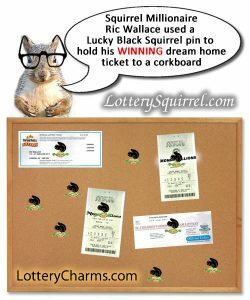 I used a Lucky Black Squirrel® pin and put a hole through the ticket, attaching it to a cork board. I did not pick the ticket numbers – they were next assigned, but rather I visualized I had the WINNING TICKET on my corkboard beside my computer and phone. 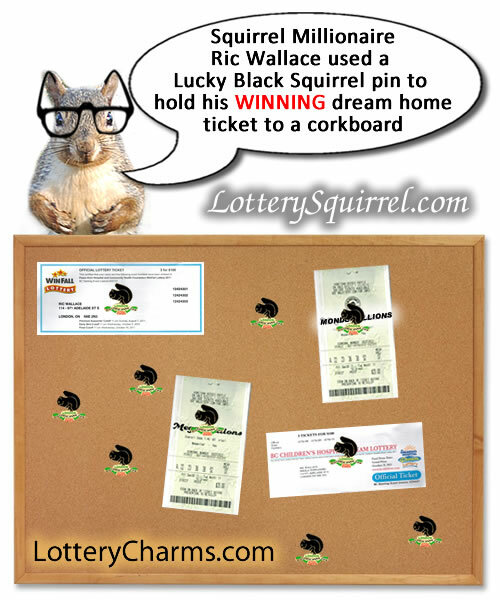 [product_category category=”lucky-pins” per_page=”100″ order=”SKU”]I viewed my dream home ticket #15772 many times a day on a cork board beside my computer until the call came in that I won the house. In my dreams weeks before the draw, I had already moved into the dream home, moving all our belongings into the right side of the double garage, as I was told that was where the drum would be and the draw would take place. I told SPARKY – the 10+ year old goldfish in my office we were going to be moving AFTER we won. When I won the dream home, I had already lived the experience weeks before the win in my visualizations or dreams. 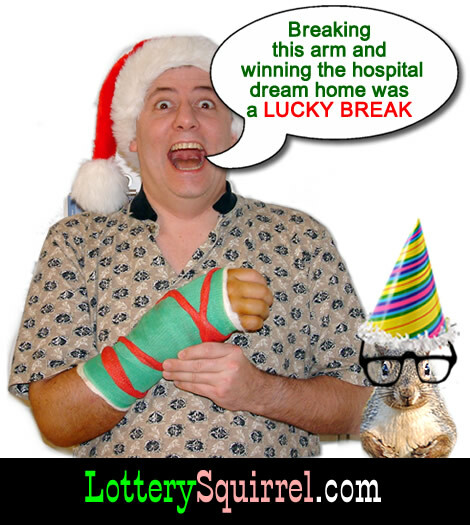 When the hospital lottery people called to tell me I won, I was simply replaying a memory or a recording. In my mind, they had no choice than to pick my ticket because all our belongings were intertwined with all the ticket stubs in the drum. I was fixated on the HOT TUB as the hospital that was running the lottery gave me use of my right hand after breaking my right arm and smashing my right hand after a fall off a ladder. After the third cast came off I was going through extensive therapy to regain the use of my right hand. I would first check in at the Hand and Upper Limb Clinic at the hospital and then soak my right hand in a mini HOT TUB like the size of a large ice bucket to loosen the muscles and tendons for about 20 to 30 minutes before various exercises with other patients. It took 9 months before I could use a manual can opener to open a can of soup with my right hand. When the cast came off I could not even push the button on a digital camera – not good if you are photographer. I was visualizing a story of someone who the hospital helped win the dream home in the media. I was even joking the HOT TUB and dream home would be part of the extended therapy program. The hospital put my story before and after the BIG WIN in a paper called the Hospital News (a nation-wide publication) twice, and then twice in their newsletter. I even made their annual report saying my broken arm was truly a LUCKY break. The therapist who gave me use of my right hand got the top award for hand therapy in North America. The x-rays of my fractured arm and hand have traveled the world to places like Scotland, Turkey, USA and even Vancouver Canada, 6 years before I set foot in British Columbia. On the day of the GRAND PRIZE DRAW I dropped my wife off at work at 9:02 am and the last thing I said was, “I will call you after the hospital lottery calls saying we WON the house.” She rolled her eyes getting out of the car. I arrived home about 9:15 am and turned off the house alarm, then walked over to the 7-11 to get a coffee and walked in the front door of the store saying “Today is THE DAY I win the house” – a strong affirmation which would come true in about 75 minutes. After chatting with a few employees I returned home. 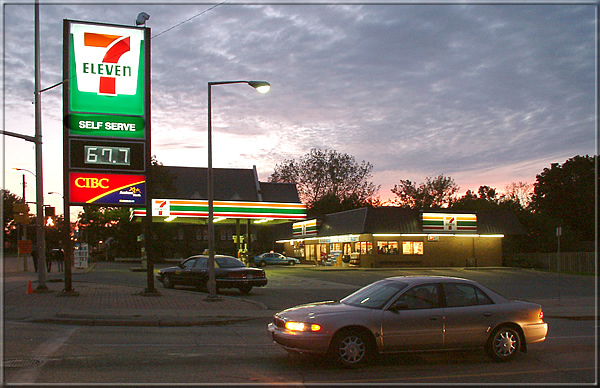 File photo of the East London, ON CANADA – 7 Eleven across the street where I ivied in 2004. When the home phone rang at about 10:30 am, the call display showed a blocked number so I didn’t answer it – block your number I do not want to talk to you, leave a message if important. About 30 seconds later my cell phone rang with a blocked number. Since only a handful of people had my cell number, I thought I’d better answer it. The person on the phone identified himself as a representative of the hospital lottery and asked if I was sitting down. I replied, “Did I win the HOT TUB?” just as I said I would do. The person replied that I’d won the grand prize which included the home, HOT TUB, and much more, which was all TAX FREE in Canada. Below is a picture of me in the actual HOT TUB included with the Dream Home package I won, taken after we got possession of the dream home. About 5 months after our win, we mailed out about 230 Christmas/Thank You cards to the 230+ suppliers, showing us in the hot tub and personally thanking the hospital and making our dreams come true. No other dream home winner there had ever done that before. We had several cards returned undelivered because those suppliers had not furnished the correct information to the hospital. If you have a business and you support a charity or event, make sure they have your current contact information. About six years later, I was talking to a gas station manager and telling her about our thank you cards. She told me she remembered seeing the thank you card we sent, as she worked for one of the suppliers. It is cool creating a lasting impression. After the news of the BIG WIN, I first told SPARKY the 10+ year old goldfish in my office, we did it. I then called my wife at work. Normally I would only call on lunch hour or 15 minutes before closing, never during regular work hours. Calling about 10:40 am was not normal. When she asked me why I was calling, I said “What did I tell you we were going to WIN?” There was dead silence on the other end of the phone. Then she said softly “the house?” I said “YES.” She still thought I was joking, but I assured her repeatedly that it was true. Then I told her to tell her boss she would need the rest of the day off, as they wanted us at the house and for interviews with the newspaper and TV news. When we moved our two goldfish to the new home, SPARKY got to ride in a red bucket on the passenger seat of the Mazda Miata MX-5 with the lid (top) off the sports car. 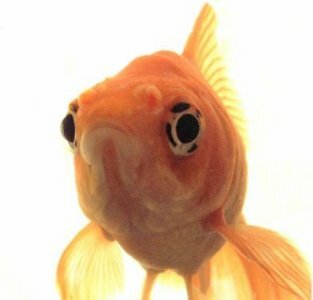 The other goldfish was in a separate bucket on the floor as we had our fish in separate schools (tanks) as they did not get along. How many goldfish have gone for a ride in a sports cars with the top down across town? A story that puts a lasting visual in peoples’ minds. 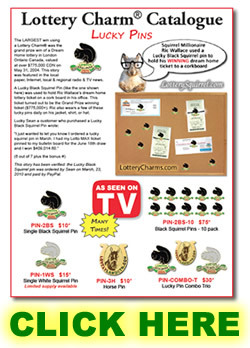 The sales of the Lucky Black Squirrel® – Lottery Charm® pins online were going crazy once the news told the story. People were buying the pins and pulling the pin back off to use as a scratcher for scratch or instant tickets or put in their pocket, wallet or purse. 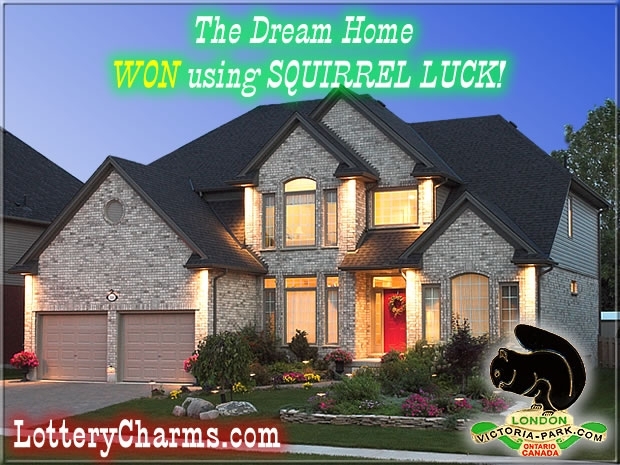 I was partly upset to hear this, so I designed a Lucky Coin® – Lottery Charm® with the Squirrel image on it. To date I have designed 3 Lucky Coins. 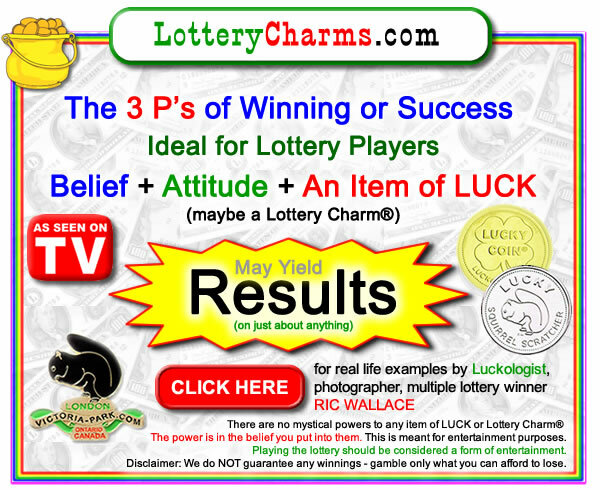 The Lottery Charm® story started with the purchase of a shredder from Staples. I had accidentally lost some receipts by unintentionally shredding them. 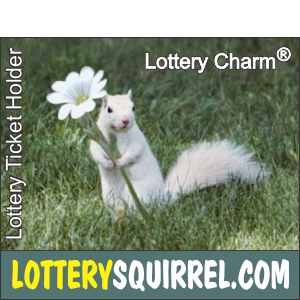 I did not want to lose the potential winning lottery ticket on my desk the same way, so I used a White Squirrel fridge magnet to hold my Super 7 lottery ticket (Canadian lottery) on a metal filing cabinet and won on 5 out of 7 numbers ($147.60). I thought this was cool and wanted to duplicate what I did, so I got another ticket on a future draw, used the same magnet, and put it on the same top right corner of the filing cabinet. On a later draw I got 6 out of 7 numbers, netting $2,408 – see below. 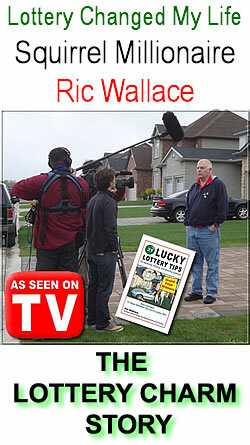 The tax-free dream home lottery win captured the interest of TLC’s the Lottery Changed My Life in 2010, and I was the first Canadian featured on this popular show. There have been other Canadians featured on TLC who have won more money, but I was the first, and this title can never be taken away. 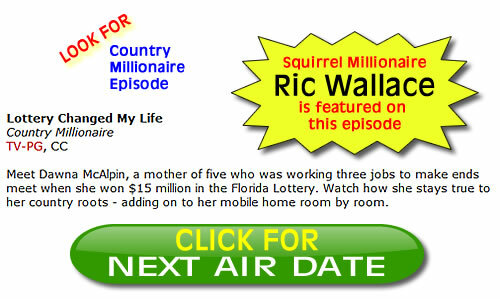 Originally they were only interested in doing a story about someone who had won a house in a lottery and had no interest in the squirrel luck aspect of my win. 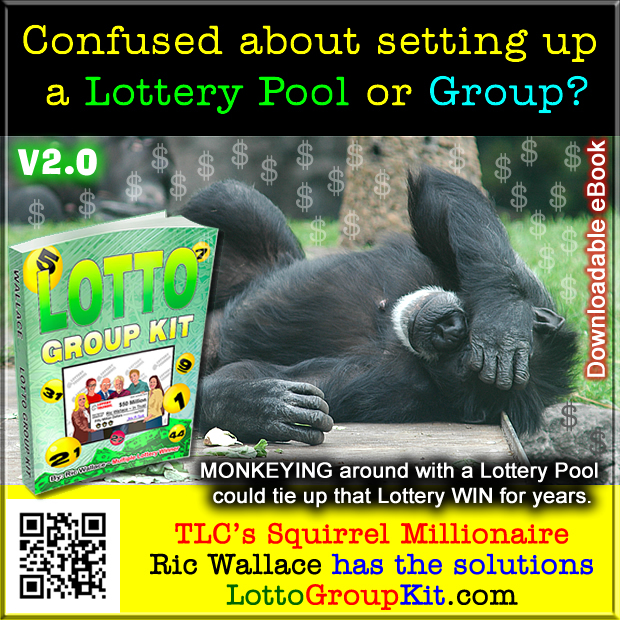 In my mind I visualized them connecting my lottery story to squirrel luck and making fun of me in the process in order to create a story that stands out. They even labelled me the Squirrel Millionaire. Big TV networks do not take direction from everyday people, but my visualizations and the info pack consisting of my first book, pins, coins, magnets, high resolution photos on a DVD that I sent by courier planted the story (I wanted) in their heads without appearing to be the director, so they could take credit for the story. It’s a matter of getting what you want but letting others think it was their idea. The good thing and bad thing about cable TV is they keep playing the same thing over and over. I can always tell when the show had aired by the spike in orders for Lottery Charms and books when checking my email inbox. 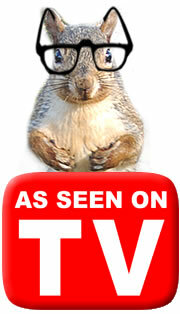 Imagine the cost to produce and air an infomercial (LOL) – it was all FREE for me. 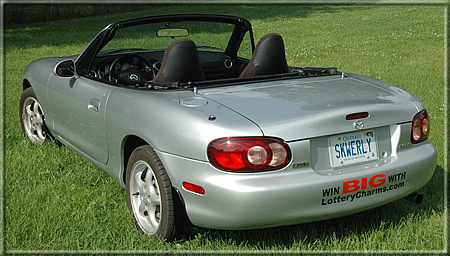 Starting a business is one of the top goals of lottery winners and wannabee winners. I enjoy making money while I sleep or out for a walk. 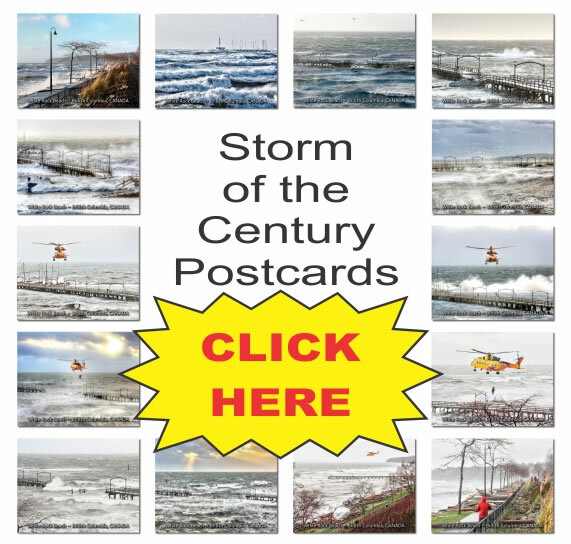 Purchasing a Lottery Charm® from this site gives my life purpose hoping to inspire others, and it helps cover the cost of this site, the products on this site and the hundreds of postcards, greeting cards, photographs, and wall enlargements I have produced. This is the final part: claim your prize, win, or whatever you imagined. I have done this countless times. (House, car, cash, computer, software, movie tickets, limo time, etc.) Time to picture something else –> #1 Picture It – #2 Process It – #3 Pick It Up. Consider the universe has an overstocked warehouse (one million times bigger than Amazon) and will give you what you want without shipping charges. The universe works because it is always moving. The earth is always rotating so the whole earth can enjoy sunshine, daylight and night time during the day. Make a list or shopping list with photos like a catalog, and start checking them off as they become realities for you. You could make a physical dream board (shopping list / catalog) to place in your home or office or create a digital one on your smart phone or tablet. How can you expect the UNIVERSE to deliver what you want if you do NOT put your order in. 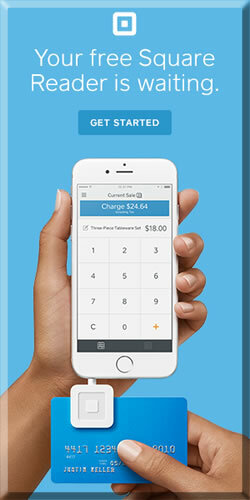 Your order could take minutes, hours, days, months, etc. Give up on your DREAMS – your order could be put on hold or cancelled. Focus on what you can do and NOT what you can’t do. Do something – move forward – the earth only rotates in one direction! If you want me to do something, tell me I can’t. I was taking stock of what I’ve done – I’ve been seen on TV, heard on radio, read about in newspapers and websites; and to date, I estimate more than 600 million people worldwide have heard one of my stories. I commented to my wife that the only thing I haven’t done yet is I have not appeared in a tabloid. I was thinking I need to be at the grocery store checkouts in a tabloid, like The Enquirer or The Globe, etc. It didn’t matter to me which tabloid, I just needed to be in one, so I placed my order with the Universe, and the very next day I got an email from Woman’s World magazine out of New York City. After searching online, I recalled seeing the magazine at checkouts, and I realized it is printed in a tabloid newsprint format. It is one of the classiest of the tabloids. 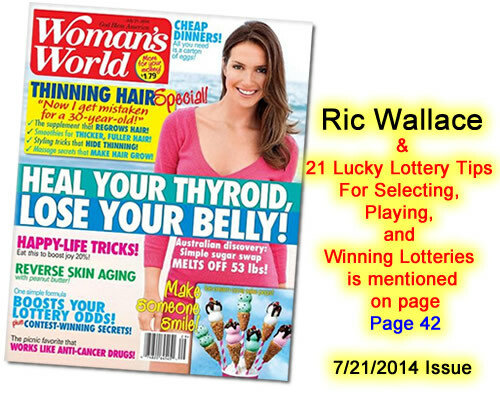 Long story short, I was featured as an expert on luck in the July 2015 issue, still available for purchase online. 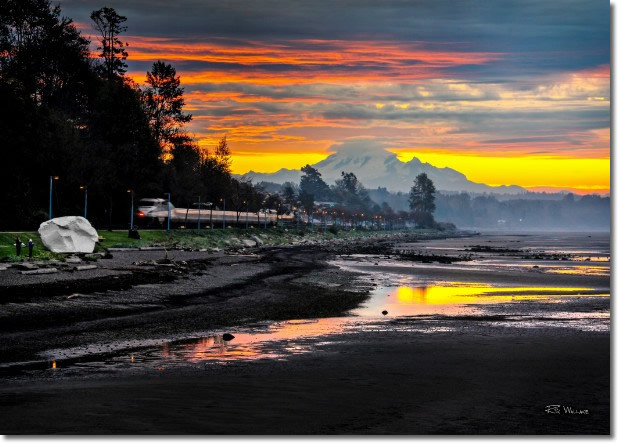 Now on the west coast of British Columbia, Canada (2 hours north of Seattle, WA USA) I am pursuing my passion for photography and have produced hundreds of postcards, greeting cards, photographs, and wall enlargements. 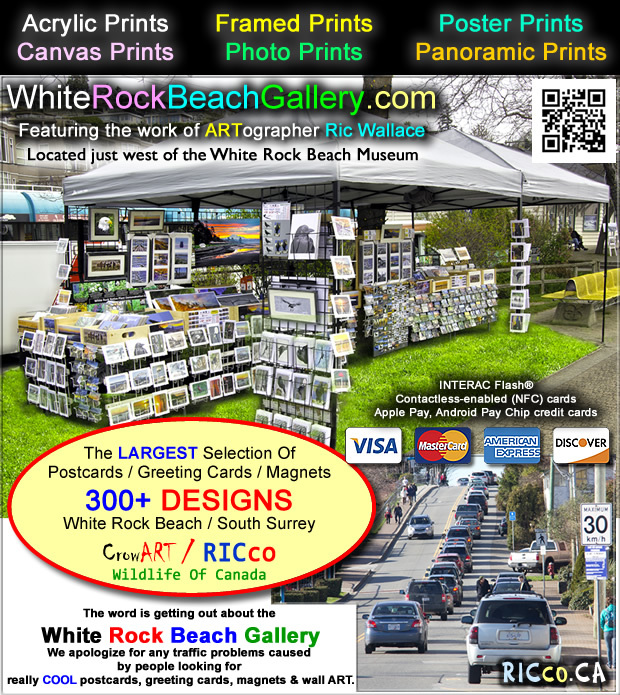 I was set up at White Rock Beach in British Columbia, Canada along the waterfront (see above photo) and selling my postcards, greeting cards, and photographs to tourists and during a lull in pedestrian traffic, I was thinking maybe I could entice TLC to do a follow-up story. I was visualizing a story of interest of my moving 3 time zones, liquidating many of our possessions, since they last filmed me. Within hours of my visualization – and still at the beach – I had a voicemail from my home phone sent to my email from the Discovery Family Channel, owned by the same company that owns TLC. They wanted to do a follow-up story of some of the TLC winners for a show called “Still Lucky”. I emailed them high res photos of the postcards and we did a Skype interview, which later aired on TV. You need to have your eyes and ears open to opportunities and act upon them when they present themselves. As LUCK would have it, I was in Woman’s World at checkouts throughout North America and on GoVancouver in the same week. Visualizations CAN work! Anyone can follow the 3 P’s of Winning or Success. 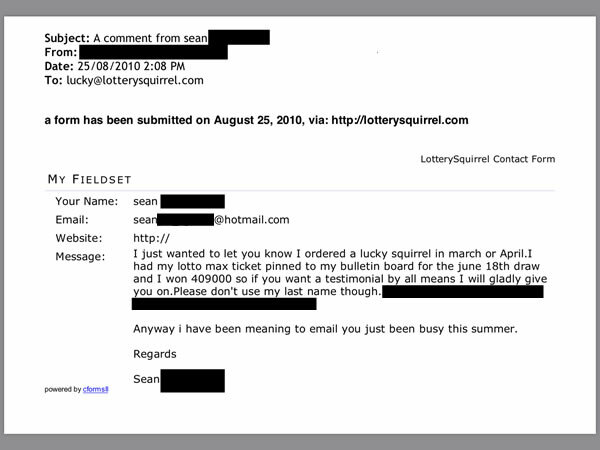 Lucky Sean tried and was able to duplicate a win doing what I did and won second prize on Lotto MAX – a Canadian lottery. 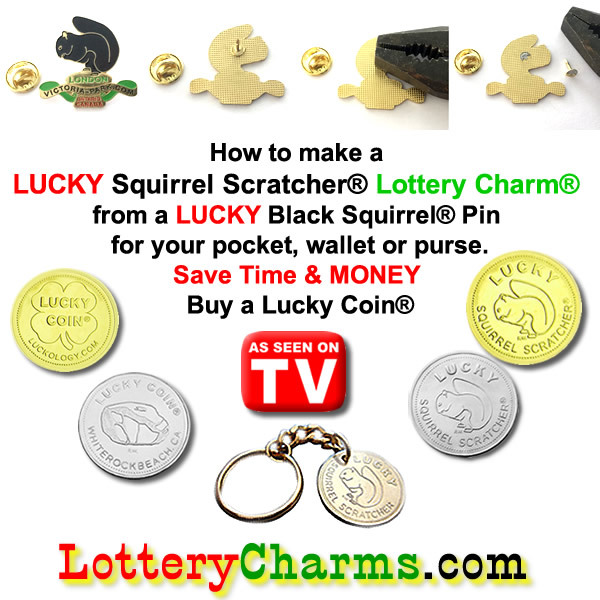 Reviewing past PayPal transactions Lucky Sean ordered a Lucky Black Squirrel – Lottery Charm pin – Mar 23, 2010. I have supporting documentation and a copy of the lottery Corporation publications supporting this win. These are available for any government agency wanting proof of the win – in person with valid ID. Revenue Canada has many copies of checks and other documentation of the many things I have won. 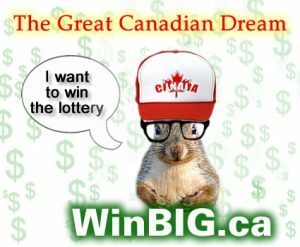 Win a lottery in Canada – Win a TAX AUDIT – part of the game. 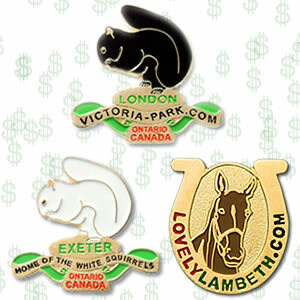 I had just received the Lucky White Squirrel pins in days before the Friday win of 6 out of 7 numbers, netting $2,408 – see above. On the following day which was a Saturday, I was dropping off a piece of furniture for a friend to a relative in Sarnia, Ontario. After dropping off the table we decided to visit the Point Edward Casino for the first time. 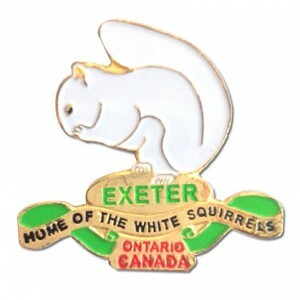 I did not have any magnets on me, but was wearing a Lucky White Squirrel pin and thought I would see if I could win using WHITE SQUIRREL LUCK. Long story short after about 5 minutes playing a 5 cent slot machine, I had 4 buckets of 3200 – five cent tokens netting $160 (3200 X $0.05= $160). This was before the machines printed out a slip. I just about got a hernia walking to the other end of the long casino on the edge of the St Clair river across from Port Huron, Michigan, USA. HP had a 1120c colour inljet printer that would print 11″ x 17″ tabloid size posters and were offering a $100 USD rebate if purchased before a certain date. With only 2 days remaining, I did not have the $900 needed to cover the cost of the printer and taxes. I wanted this so bad, as I had a customer that had one and it would allow me to print posters for the people I do websites for. I told my wife I wanted to go the slots to WIN $900 so I could buy the printer and qualify for the $100 USD rebate (this was an affirmation). I took two $20 bills and was wearing two Lucky Squirrel Pins; my wife took one $20. If you go to a casino have a limit and leave the plastic cards in the car or at home. I walked around for about 4 minutes until I saw a 25 cent slot machine I could see myself winning on. My wife wandered off to a machine on the back wall. She lost the $20 she brought and was walking to find me. She found me sitting there doing nothing. She asked “What are you doing?” I responded “I am waiting.” “Waiting for what?” she asked. I said “My money.” She asked “How much?” The amount was $900 – they paid out the WIN in nine $100 bills, exactly the WIN I projected. I only took what I needed ($900) and headed to Staples for the printer. I paid cash and qualified for the $100 USD rebate. The rebate followed weeks later and when cashed from USD to Canadian dollars paid $152.10 – another win to be used for FREE ink. Staples must be a lucky store as I have 3 wins tied to them – 4 if you count the $152.10 rebate. I have done this many times at casinos. I am not a fan of CASINOS because of the noise or smoke (Canadian Casinos are now smoke free). I once did a website for a company that would reupholster the seats in a local casino because some players will sit in front of a slot machine for hours at a time until they win – quite often wetting themselves or other body functions. If you go to a casino, inspect the seat before you sit, and wash your hands twice before leaving. Travelling across Canada we stopped in casinos with the goal of winning a few tanks of gas. I would estimate the gas part of our trip was covered with casino slot wins. Sometimes smaller wins keep you under the radar – all legal. Too many big wins can lead to problems of being accused of cheating or a tax audit. 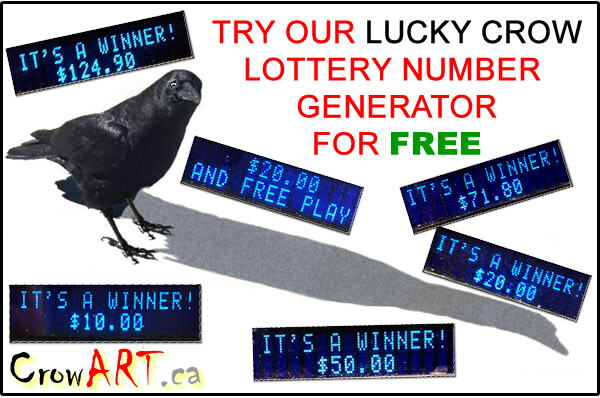 Lottery WINS in CANADA are TAX FREE. I was contacted by a former employee of the Windsor, Ontario Canada casino and was told of a customer who would do what I do. He also would intentionally lose some days using his reward card to show he was not winning every day. He took a bunch of casino employees out to lunch picking up the tab and told them what he does. His house, father’s house, truck, vacations were all compliments of the casino. If you decide to pursue this, I would suggest not using the reward card most of the days you plan to win and using it the days you plan to lose. If your losses are far greater than your wins, time to quit. Casinos and lotteries do not like to see the same people taking their money. 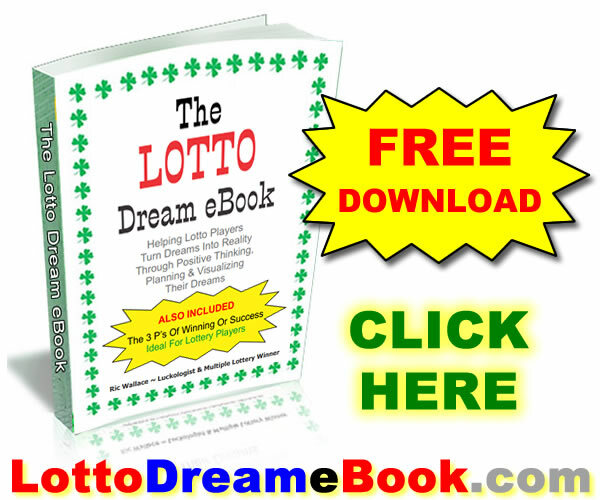 Win a lottery – you are GUILTY of Winning a lottery (it sort of implies you have done something wrong). 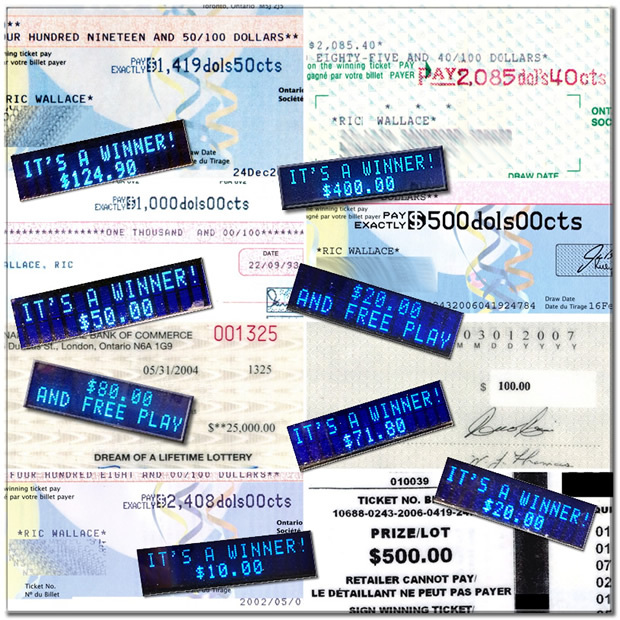 Another tip for lottery players is to play lotteries with a payout a retailer can make. I know of a lotto player that plays a keno game that has a maximum payout of $500 which a retailer can payout with no papers other than the ticket to sign. The money that they have made doing this is more than what they make at their full-time job. If your losses are far greater than your wins, time to quit. I have had many fortune cookies give me a good, positive or LUCKY fortune. I have visualized many of them only to have them come true. 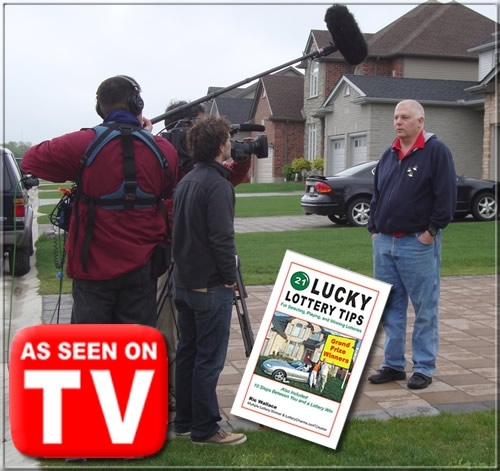 14 hours later a lady in Washington DC contacted me by email about maybe being on The Lottery Changed My Life shown on TLC and the BBC. I had never heard of this show. Your destiny is to be famous. I placed this beside my Dream home lottery ticket on the corkboard. I have achieved this many times – on TV, radio, newspapers, tabloids, websites, blogs, etc. A lottery win could be in your near future. I played the numbers included and played the numbers 3 times on the same ticket – all 3 lines paid out. If you like what you read, make it an AFFIRMATION – Make what you visualize a reality. I knew someone in a job they were not happy with and stressed out going to work every day in the early morning hours when most people were asleep. I reposted to Instagram and forwarded the post to the person. Out of the blue they got a phone call for a interview from another company. The person felt the interview did not go the way they wanted and no job would follow. Weeks later they got a call offering more than they were making during daylight hours. I feel the repost was a factor. Got a good fortune cookie fortune to share with family or friends? Feel free to share on social media. 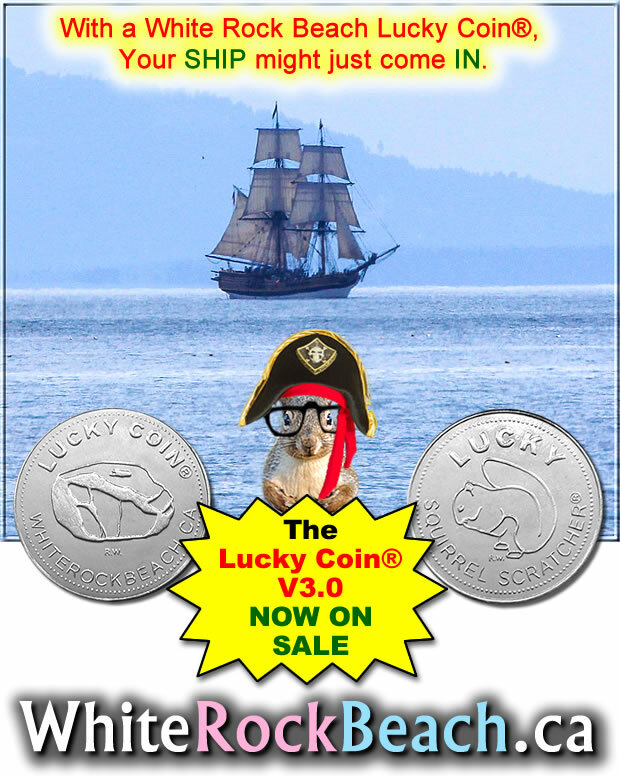 THINK YOU WILL LOSE A LUCKY COIN? 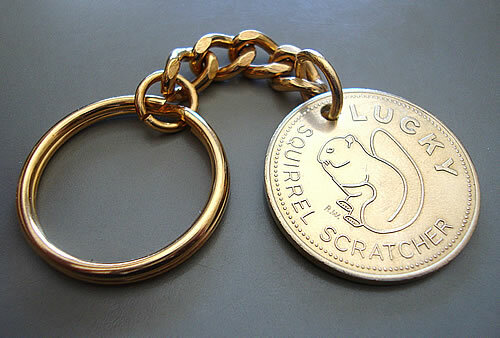 PLEASE CONSIDER A LUCKY COIN KEYCHAIN. Disclaimer: We are giving personal experiences and do NOT guarantee any winnings – gamble only what you can afford to lose. If you are a person who says or believes they will never win the lottery, SAVE YOUR MONEY AND DO NOT BUY TICKETS. If you have a belief and attitude you are a winner, anything is possible. An item of LUCK could be an item you find on the ground, something you purchase in a store or online like a Lottery Charm, a color, an article of clothing, etc. 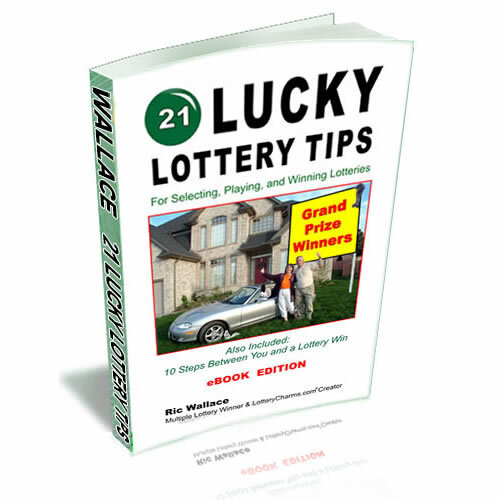 This blog contains experiences by Ric Wallace and his belief in LUCK. The information contained in this site is provided for general information, entertainment & FUN purposes, and should not be construed as investment advice. This site is NOT intended to replace advice offered by a QUALIFIED investment planner with a track record of successes. Investing in the stock market can also be considered a form of gambling with the potential of gains or loses. A comedian once said if you want to double your money – FOLD IT IN HALF.